Hydroponics is a type of soil less agriculture. 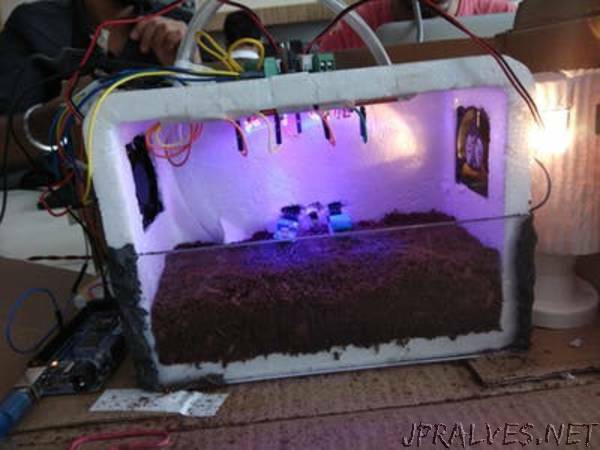 Soil looses its nutrients and fertility with time, so to avoid that we can use Hydroponics. Plant growth and nourishment can be improved and control too. Plant which can grow only during a specific time of the year and be grown throughout the year. We can also monitor the growth of the plant, nutrient level of the soil, moisture contained in the soil and the amount of light received. This project is a model of the actual system. Here we are replacing soil with cocoa powder. We can control the moisture and nutrients contain of the cocoa powder easily with respect to normal soil. In this project we are controlling only three criteria for plant growth i.e. moisture, light and temperature. Temperature :- 25 to 30 degree Celsius. Humidity :- 50% to 80%. Light intensity :- 250 photons per sec.